Interim President of Tidewater Community College, Greg DeCinque, discusses the importance of workforce education and funding. Click the link below to read more about the challenges currently being faced, the benefits of investment, as well as the committment to improvement. 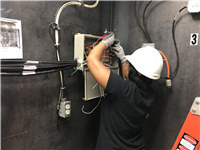 The Virginia Ship Repair Association is pleased to announce that we have received an OSHA Susan Harwood Grant to develop maritime-specific electrical hazard training. Please click here for more information on the Susan Harwood Training Grant Program and award announcement. John Warren, Director, Department of Mines, Minerals and Energy spoke to the VSRA Membership at the April Luncheon. Please click here to view Mr. Warren's presentation. Please click here to view CAPT Bauer's presentation, an Overview of SURFMEPP, from the November 14, 2017 General Membership Luncheon. A new partnership between Tidewater Community College and the Virginia Ship Repair Association (VSRA) offers a Pre-Hire Training Program in Pipefitting for students seeking immediate employment in an in-demand career field. The VSRA program is designed to help meet the workforce needs of regional shipbuilding and ship repair companies by providing hands-on training in pipefitting. Students enrolled in the program learn to install and maintain high and low pressure pipe systems and support equipment aboard waterborne or Naval vessels. 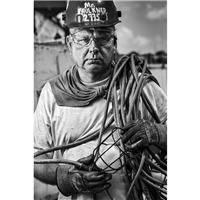 "Photographer's wide-ranging eye for faces and landscapes on display in Hampton"
Please click here to view a recent Daily Press article reviewing Glen McClure's exhibit on the Ship Repair Workers of Hampton Roads. As many of you may be aware, the negative impact of Congress not approving the recent Navy supplemental appropriations request combined with possibly having to operate the entire year under a Continuing Budget Resolution will be devastating to our Navy’s fleet. The Virginia Ship Repair Association provides this information so that local member companies and their employees may share with the entire Hampton Roads community and ship repair companies nationwide to contact their members of Congress and voice their concern by urging them to pass the 2017 National Defense and Mid-Year Supplemental Appropriation Bills to alleviate this very disastrous situation. Reference A - Navy CR Implications Info Paper, please include with each letter sent. DFARS Cyber Security Change: 252.204-7012 Safeguarding Covered Defense Information and Cyber Incident Reporting. December 31, 2017 is the compliance deadline for DFARS 252.204-7012 Safeguarding Covered Defense Information and Cyber Incident Reporting. You can view DFARS 252.204-7012 HERE. In preparation for this compliance deadline, VSRA has developed a Cybersecurity Committee to assist companies in navigating this federal requirement. The Committee meets on the 4th Thursday of each month at 9:00 AM at the VSRA Office in Downtown Norfolk. Please contact Barbara Washer, VSRA Development & Event Strategist, for more information: (757) 233-7034 or BWasher@VirginiaShipRepair.org.